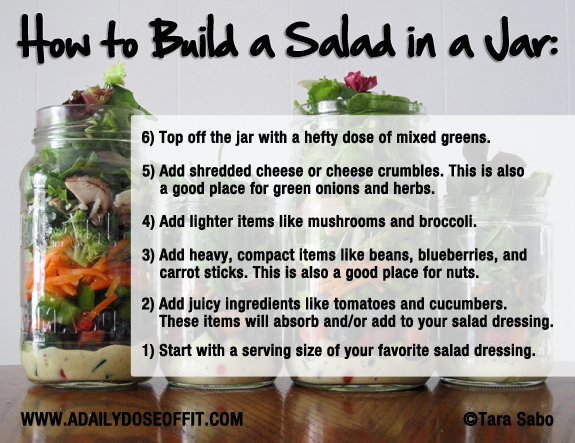 Friends, let me reintroduce you to the famous salad in a jar concept. I say "famous" because if you read healthy living blogs or surf Pinterest, you have no doubt seen pictures of this awesome prep-ahead meal. The assembly process takes minutes, although there is a bit of strategy involved. When you get close to the top, if it starts to look like you might run out of room, just remember that lettuce can be very compact when it needs to be. Shove it in, friends! It'll spring back to life on your plate. I know, right? A healthy meal in no time flat. 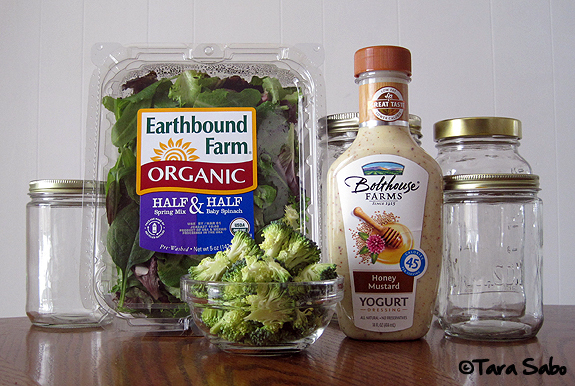 Salads in a jar are so easy to pack in a lunch sack, and take just seconds to prep for consumption: Step 1, open the jar. Step 2, shake it out! And salads themselves are so versatile that, not only does this make for a great prep-ahead meal option—it also makes for a great "use up all the leftover produce" option. Salads for the win, for real. 1) Use different jar sizes. 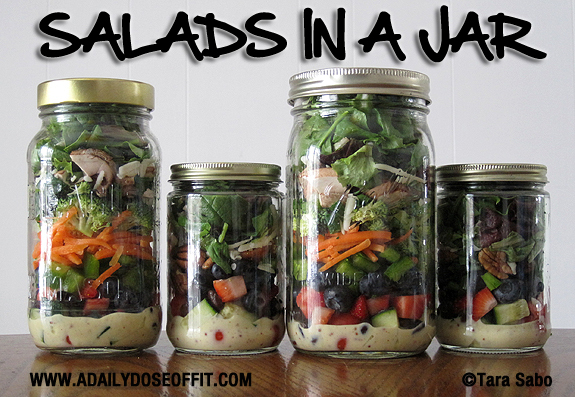 Big jars make entire meals, small jars make great side salads. 3) Experiment with herbs. They add a surprising kick of flavor to otherwise mild greens. 4) Don't make more than you can eat. Wasted produce is a sad sight to see. 5) Don't forget your proteins. They make the meal. Question: What's your best piece of make-ahead advice? Another weekend behind us. They go by so quickly, but I am trying not to complain about it anymore. Saturday and Sunday are such short days, really, that I am trying to make the best of them no matter what we've got on the agenda. I can't stop Saturday and Sunday from coming and going so quickly, but I can stop thinking of them as gone before they actually are. Go ahead—shift your mentality in this way. You might find that it makes a huge difference. 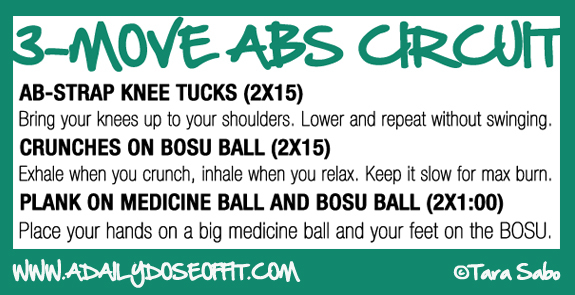 If you don't have access to ab straps, you can always do reverse crunches. Man, I love me some ab-strap action, though! They kill me every time. Speaking of "killing me," I've been thinking about the half marathon I listed in my goals, plans and resolutions for 2013. I spent some time this weekend mapping out a potential training plan. I have a race in mind, and if all goes as planned, I will sign up for it by the end of this week. More on that later, but I'm excited to get back into a more regular running schedule. It's been sporadic as I've been focusing on Spinning more now that I'm instructing. Are you on Twitter? I'm slowly getting used to this fast-paced social environment. I spent more time than usual this weekend scrolling through all the updates—man, there's some good information out there! I thought I would end today's post by linking you up to some of the articles I "favorited" recently. Be sure to follow me on Twitter for more of the following and, if I'm being honest, the occasional update about me. I don't promise seriousness in every tweet. I tend to be goofy from time to time. You'll see. Quiet time while the rest of the world (my world) is still sleeping. With a side of oatmeal and my book. I mean, it takes me no time whatsoever to polish off a bowl of oatmeal, but still. I love those first few minutes of my early morning. And then it's off to the gym. Question: How early do you wake up during the week? Is it for a workout? I haven't done Pinspiration Thursday in about two weeks. First, it was Workout Week and I was too busy supplying you with an Upper Body Builder. And then it was Valentine's Day. But here we are. Back at it with the inspir—er, Pinspiration. Although, I must admit that I found today's post the old fashioned way. From a notebook full of quotes. I was never much of a journal-keeper, but I loved this little notebook so much that I absolutely had to use it for something. So it came to college with me, and that's where I turned it into a quote book. So remember, and especially remember this in the gym: The easy way is not always the best way. 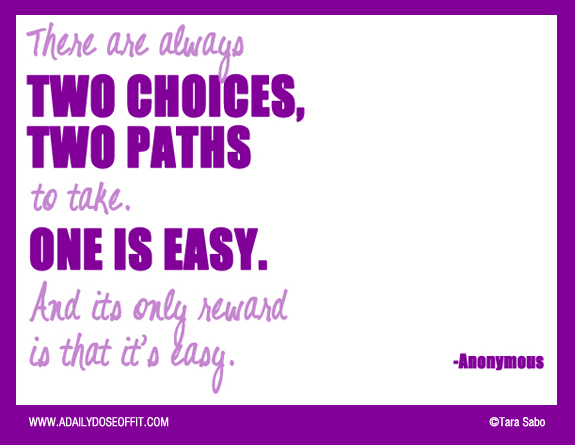 Take the path, make the choice that'll challenge you the most. That's how you foster growth, both internally and externally. I promise. Question: What's your workout of choice when you feel like making it an easy day at the gym? Is it yoga? Light jogging? Tell me. ...for like, five seconds before the wheels started churning out motivation to think and act. I soon found myself jotting away in my Daily Dose notebook, planning future posts and writing down potential topics. And then I found myself at the computer. Seriously, why can't I just be lazy? I decided to take a semi-lazy approach to today's post. Instead of writing up one of the posts I had planned out, I'm knocking off another item on my 28-Day Blog Challenge list of things to do. Meaning, behold five more popular posts from A Daily Dose of Fit. They've all been updated for your re-viewing pleasure. So I work at a gym, right? This means I have all the toys in the world at my disposal, which also means I can craft workout after workout and never get bored. It also means I have no excuses when it comes to NOT working out. Even when I wasn't working at a gym, I still had a gym membership. Forking over money for access made it really easy for me to keep working out. Why waste the cash, right? But I realize that not all of you have gym memberships. And I realize that not all of you have fitness equipment at home. Don't worry—I won't preach to you how much it's worth it. It's a personal decision, one that must be made according to your individual financials. Or perhaps according to the availability of decent facilities in your area. I am, however, going to preach that you don't need a gym to work out. There goes that excuse, right? Here's a handy infographic for those of you that don't have access to a gym. 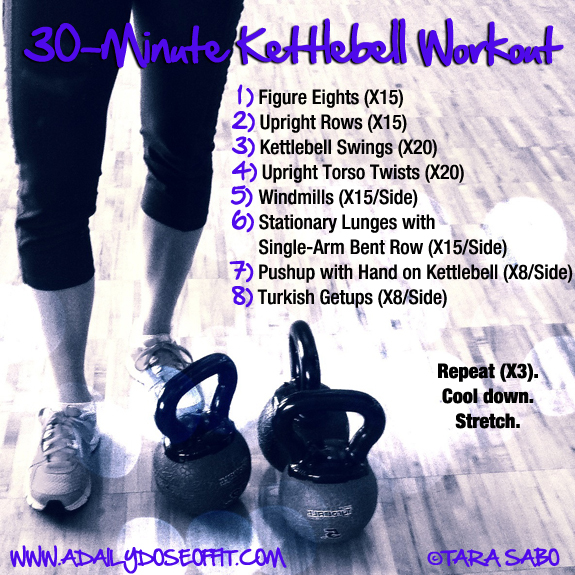 It's a great 30-minute workout that doesn't require any equipment, except maybe a chair or a bench or step which should be readily available to you. If it looks too intense, you can modify as needed (as always). You can find more bodyweight exercises at Greatist.com...seriously, if you haven't checked out their site yet, you totally should. Such useful (and interesting) info. Question: What's your favorite bodyweight exercise? Just popping in today with a plank variation that I think you'll love. If you follow me on Facebook or Instagram, you might have already seen it. I really wanted to run outside today, but there was just too much winter going on for me. I don't mind running in the snow, but my latest route has me running on some streets that get fairly busy—and I didn't want to run the risk of getting involved with any sliding cars. But I was not in the mood for five miles on the treadmill, so I opted for 30 minutes on the Gauntlet instead. Self torture? Yes. Did I enjoy it? Yes, of course. Side planks with an exercise ball. Otherwise known as my new favorite plank variation. It's a great way to target your inner thigh muscles because you have to squeeze the exercise ball. Well, you don't have to, but that's the point. So squeeze it if you try it. 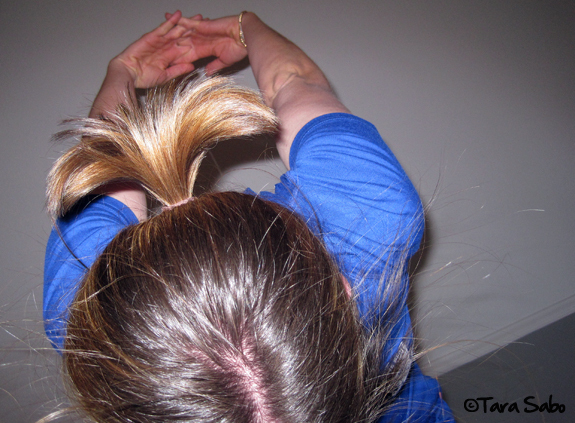 It also challenges your balance a little, which is always nice when you're working core. I wish I could say that I came up with this on my own, but I actually spied another trainer doing it with one of her clients. Best thing about working in a gym? Learning from your coworkers. Question: What is your favorite plank variation? What's your plank PR? How much chocolate did you eat yesterday? Me...believe it or not, I didn't have any. I'm a Catholic and it's Lent, so I gave up sweets. I always do. If you know me, this is a huge sacrifice. I also vowed to sacrifice spending unnecessary time doing unnecessary things. (I'm looking at you, Pinterest and Facebook.) Here's to using the next few weeks to reflect on making positive changes in my life, which obviously extends the whole "resolution" concept from January. No, I haven't seen the movie. And yes, I'm a little intimidated by the book. It's been a while since I've read classic literature. I'm used to Oxygen Magazine and whatever is in my Google Reader, plus the occasional fun book (I just read Gone Girl, for example). Needless to say, I'm fairly certain the above will take me some time to get through, but I'm always up for a challenge. Like, say, taking and teaching my own TRX class yesterday. I don't have any pictures because it was a spur-of-the-moment thing, but I was feeling so good from a 4-mile run that I just had to keep the physical activity going. And then I taught Foam Rolling. 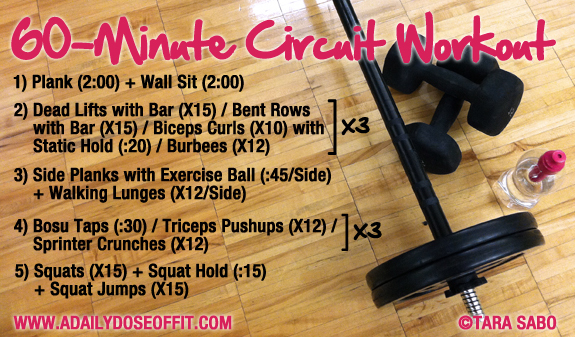 So today, my core is sore and I'm not sure if it's because of this morning's Circuit Sculpt or yesterday's TRX class. What about Saturday and Sunday? Well, Sunday will be a rest day. But tomorrow...I'm hoping for some cardio. I would really like to bust out five miles of running outside, but that all depends on the weather. And/or whether or not I can handle five miles inside on a treadmill. If I don't feel up for it, I'll forgo the depressing (translation: boring) run for a nice jaunt on the Spinning bike. Question: What kind of workouts will you be doing this weekend? 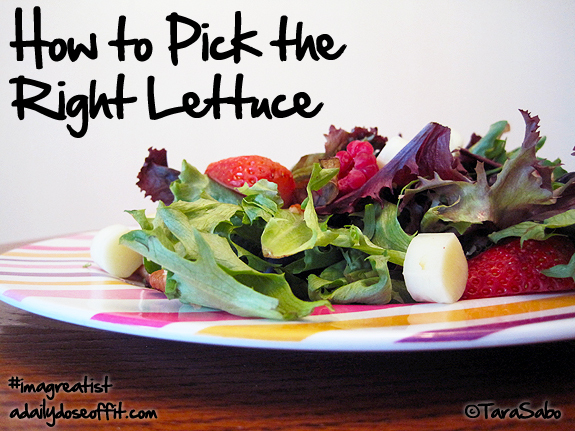 I have been working on a few behind-the-blog things over here at A Daily Dose of Fit. It's all part of Katy Widrick's 28-Day Blog Challenge. I want to make sure that I am putting out the best possible content, and doing so in a way that's relevant and wise. I won't bore you with all of the details (because some of them are, in fact, truly boring), but I'm sure you've noticed the new headshot (—>). And maybe you've read my updated "About" page. So today, I thought it would be fun to re-introduce you to five of the most popular posts from my past. Of course, they've all be updated. 1) What does your plate look like? 3) Power Balance Wristbands: Real or Fake? Question: Are you a blogger? Leave me a link to your most popular post. I'd love to check it out! I think it's safe to say that most people despise Mondays. Regardless of what you do for a living or how frequently you work from Monday through Friday, we've all started yet another week. Another set of five days until those two golden days arrive: Saturday and Sunday, days of rest and relaxation or non-stop fun and excitement. But, in case you've forgotten somewhere in those last two sentences, today is Monday. Day of stress, perhaps. And yet, it doesn't have to be. There are easy ways, in my opinion, that you can infuse a bit of relaxation in your Monday. Or any day, really. They're quick, they're easy and they hardly cost a thing. It does a wonderful job moisturizing my dry winter hands, but it's the scent that really gets me—It smells like every tropical vacation I've ever taken, which then reminds me of how relaxing those tropical vacations were. So for as long as it takes me to rub the lotion in, and then as long as the scent stays on my hands, I am relaxed. So find and use a lotion that reminds you of something relaxing. Music has the power to heal, restore, motivate and (insert word here). So use it. You've no doubt already built up a collection of good tunes, right? Turn to those tunes when you're feeling stressed. There's bound to be something that'll unwind you. For example, right now, I'm mega-obsessed with the Phillip Phillips' CD. He's totally my new favorite running buddy—and he doubles as some nice background, chill-type music. Sometimes, just opening a window for a few minutes and letting in some air is all it really takes to rejuvenate the room you're in and, consequently, the state of mind that you're in. If you have time to actually get up and go for a walk—do it. Give that to yourself, even if it's just for five minutes. Five minutes spent relaxing outside, perhaps outside of your "toxic" environment, will do you some wonders. 5) DRINK A WARM BEVERAGE. It's a selection of herbal teas from Traditional Medicinals, complete with a teacup and a reusable shopping tote. I'm not really up on all that herbs can do for you, nor do I know for certain whether or not they actually work, but hey...I guess they're worth a try for problems like digestion, bloating and sleeplessness, right? I'm pretty sure you can find Traditional Medicinals teas in most grocery stores, but you can also take a shot at winning exactly what you see above if you feel so inclined—so gracious of Traditional Medicinals to offer the goods to you, too! Alright, so tell me—What is one easy thing you do to relax yourself? Note: I purchased the lotion with my own money...or maybe it was a Christmas gift, I can't remember...but the tea was sent to me to review. All opinions are my own, obvi. And I would have put "drink a warm beverage" on the list regardless of the free tea. So there. Bottoms up! 1) Keep your chest up in your goblet squats, and be sure to pick a single dumbbell to hold at your chest...one that's heavy enough to challenge your squats. Feet should be wide, toes pointed out. 2) Jump into a lunge, return to neutral, jump into a lunge on the other side. Keep these going until you hit 20 total, ten per side. 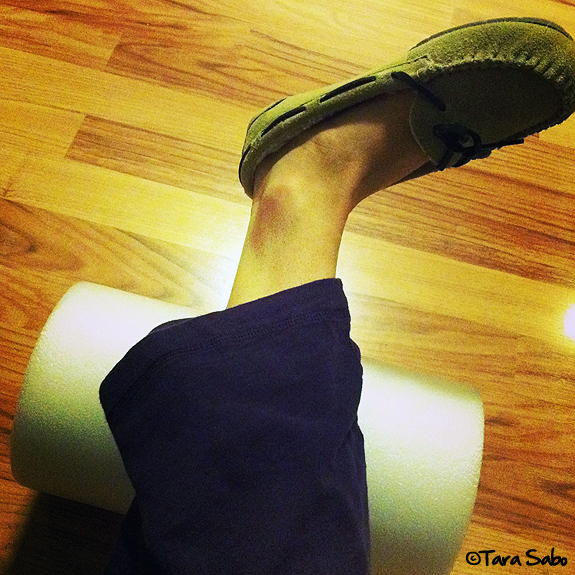 4) Tie a stretch band around your calf muscles and step in one direction, to the side, 15 times. Repeat going in the other direction. Never let that band lose tension! Hi, hips. 5) Whether you stand on a step or the floor for your calf presses is entire up to you, just make sure you add some weight via one or two dumbbells. And with that, I leave you to your Friday. 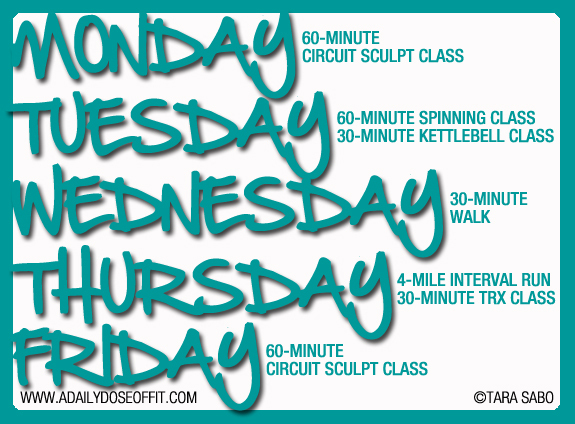 Question: What was your workout schedule this week? Did you do anything that made you feel particularly stronger than usual? Hey! So it's Wednesday of Workout Week. If you missed Monday and Tuesday, no need to worry. We tackled a 30-Minute Hill and Flat Treadmill Workout and a Total Body Toner. 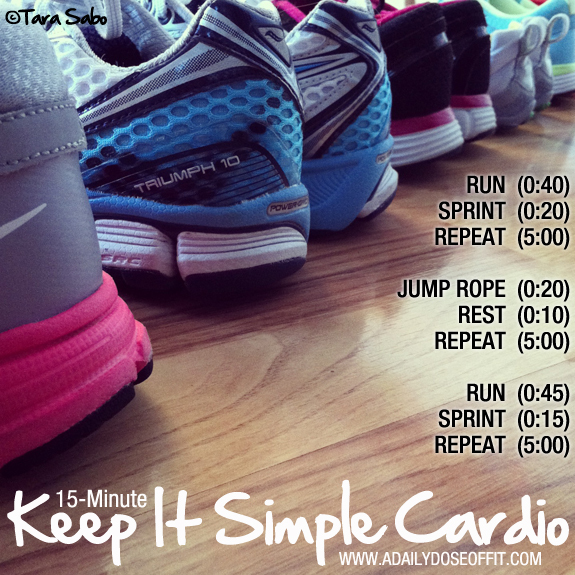 And today, I've got a 15-Minute Keep It Simple Cardio workout for you. I like short cardio workouts like this for days when I'm not really focusing on cardio, but still want to feel my heart pumping a little bit. You could, for example, use this as a warm-up. Or a halfway point cardio blast. However you choose to use it, please make sure the pace at which you jump and run is one that's suitable to your fitness. And if you absolutely hate to jump rope, try jumping jacks or just flip the rope next to you as you jump. Speaking of cardio and hearts pumping, did you know that it's American Heart Month? Heart disease is the leading cause of death for men and women in the United States, so all month long, the American Heart Association will be doing what it can to generate awareness. I'll do my part by, once more, reminding you how important it is to lead a healthy and active life. Control your weight, quit smoking, watch your diet...you've heard it all before, right? What better time is there to put it all into practice for real and for good? Question: How do you keep your heart healthy? 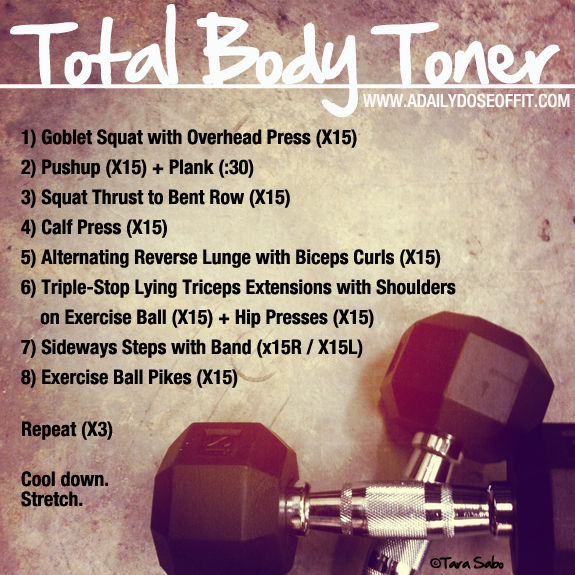 Today, I've got a total body workout for you. It's three rounds of eight exercises, so it shouldn't take you horribly long to complete. Please make sure you warm up beforehand. As little as ten minutes of your favorite cardio will do, but you can be an overachiever if you feel so inclined! And if you'd like, do shorts bouts of cardio in between each set of eight exercises. Of course, this isn't necessary but it might up your burn (in a good way, of course). 1) Remember, goblet squats take your elbows down to your knees to ultimately create a lower-than-usual squat. Yeah, inner thigh! 2) Go right into your plank after your last pushup—keep those knees off the ground! 3) Squat thrusts are burpees without the the pushup and jump. Instead of standing up after each squat thrust, grab your weights and assume the position for a bent row. If your weights are hexagonal, you may even be able to keep them in your hands the entire time (as long as they don't roll out from underneath you when you squat thrust). Or, just place them on the ground, then move your hands to the ground before you squat thrust. 4) Calf presses, nothing crazy. 5) Pretty self-explanatory here, too. 6) Triple-stop lying triceps extensions are just like skull crushers, only you pause three times on the way down to increase the effort put forth by the triceps muscles. Lie down with your shoulders on an exercise ball, pushing your hips up toward the ceiling for an isolated gluteus exercise. Hold this position as you press the weights up toward the ceiling—this is your official starting position. Lower the weights (stopping three times along the way) toward your shoulders, press back up and repeat. Put the weights down when you're done and finish out the position with some hip presses. 7) Side-steps with an exercise band...tie one around your calf muscles and giant-step to the side 15 times, never letting that band relax. Follow up on the other side. 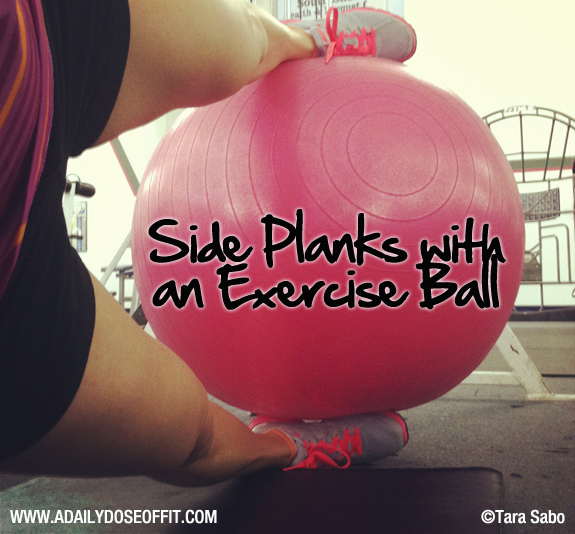 8) You can also do exercise ball pikes with a disk or ValSlides if balance is an issue. 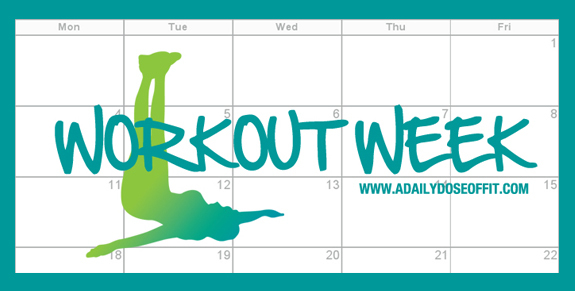 Welcome to another edition of Workout Week! 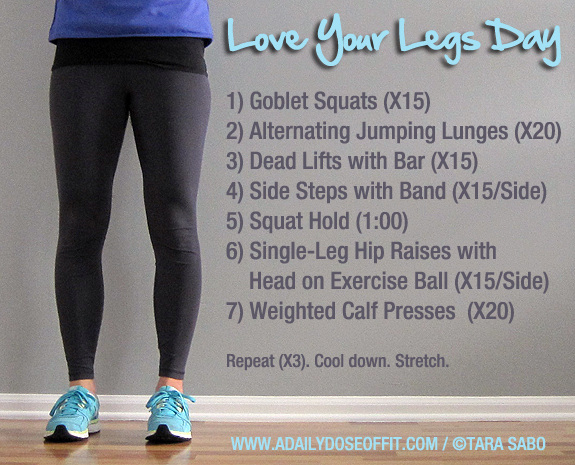 Every day this week, I will provide you with a workout that you can a) File away for later, or b) Do with me. But first, I must remind you you: Please make sure you have the go-ahead from your doctor to exercise. If you haven't done so in a really long time, I urge you to speak with him/her first. Better to be safe than sorry, right? And speaking of "being safe," please remember to work at your own pace. Whatever I provide to you is merely a suggestion, and to get the most benefits, you'll need to be honest with yourself about how much you can really do. Push, but don't hurt yourself. 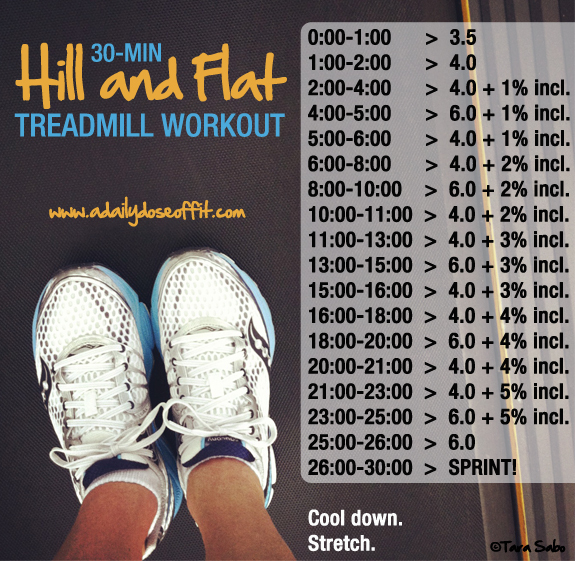 Up first, a 30-minute treadmill workout that tackles a hill, then a flat. It's great for those days where you just want to get in, get moving and get out. Don't get too hung up on the numbers. Just use them as a guideline or pattern to follow. Where I provide a running speed, just walk if that feels better to you—but try and walk at a faster pace if that's comfortable. Not only are we heading up a hill with this one, we're playing a bit of an interval game and ending with a sprint. Triple whammy. 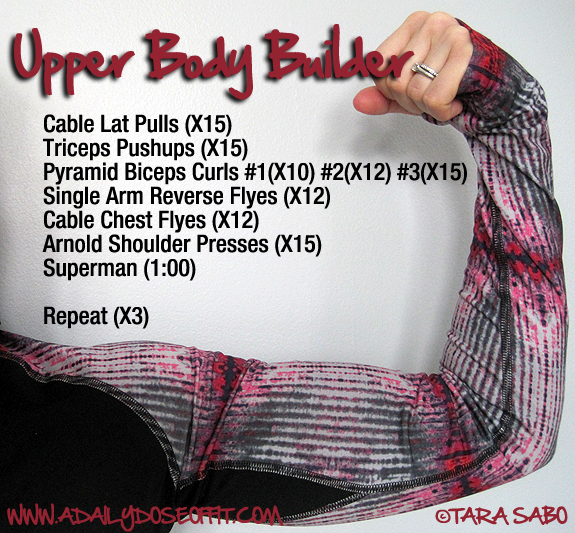 Up tomorrow, a total-body workout. Woot! One of my absolute most favorite things to eat is a premixed nut/berry/greens salad from my local grocery store. I add cheese, sometimes eggs or lunch meat. 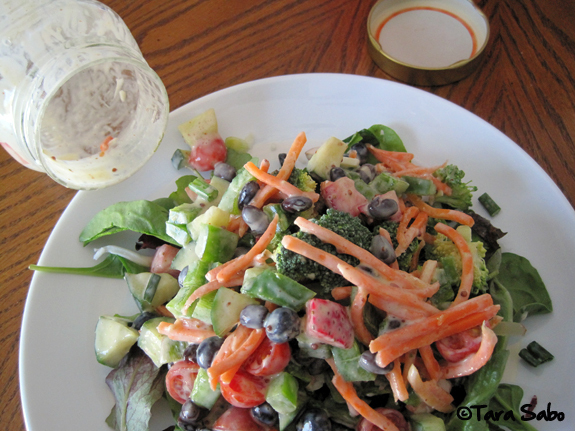 And I usually go for a yogurt-based honey mustard dressing. Or some Garlic Expressions. It barely costs me a thing, but it offers up a ton of nutrients. From the fruit and nuts, sure. But also from the greens—at the very base of this salad is an awesome mix of healthy greens. I'm pretty sure Romain, Red Leaf and Arugula are all present. Not a single Iceberg leaf in sight, and that's fine by me. You know that Iceberg is low in the nutrient department, right? Right...but it's favored by so many. It has a neutral taste, sure. But it's also super cheap which is probably why it's so popular. It's not like you can't eat it, but learn to use it sparingly in your salads. Maybe add it to a bowl full of other (possibly more expensive but definitely more nutritious) lettuce leaves, for example. No go, think about the above when you hit the grocery stores this weekend. And while you're at it, have a wonderful Saturday. I'm a little bit snowed in right now. It's a-comin' down. Winter in Michigan, man. 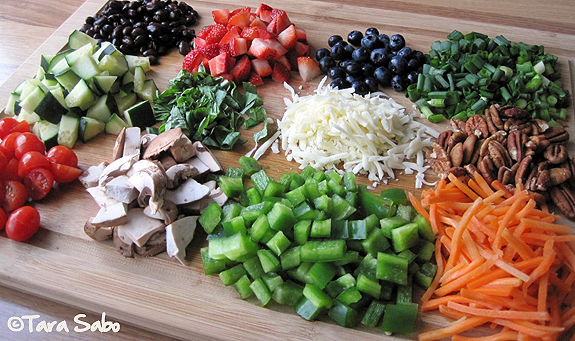 Question: What three things must you always have on your salad? I've decided that this year is going to be the year that I really dig deep into all things A Daily Dose of Fit. I'll have been doing this for three years in March, and although I never want it to feel like a job, I feel like there are ways that I could definitely improve and grow ADDOF for your benefit as well as my own. So when Katy Widrick proposed a 28-Day Blog Challenge I thought for a second about whether or not to participate—and then decided to participate, obviously. Check it out for yourself if you're a blogger. It doesn't matter how long you've been blogging or what you blog about, all the suggested actions are great for oldies and newbies alike. I'll be following #28DBC to see what everyone else is up to, and keep an eye on ADDOF. See if you can spot any changes as the month progresses. Some might be obvious, others...not so much. 1) Mango is my favorite. Hands down, without a doubt. 2) It has been confirmed—Sneaky Pete's is, indeed, gluten-free. Hooray! With that, I leave you. Time to get started on the #28DBC...and honestly, I'm zonked out from an early client followed by my usual 6:00AM Circuit Sculpt class. We didn't use any weights in class today. Yeah, bodyweight exercises! Question: Tell me about a time you really challenged yourself at the gym? 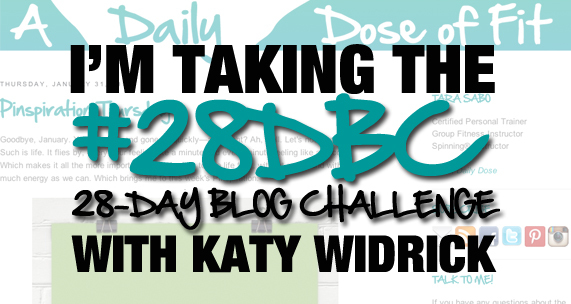 And if you're following Katy's #28DBC, let me know so I can take a peek at your blog!